Yoga doesn’t have to just be a way to exercise. Why not take the time to meet a potential partner while you are relaxed and soaking up the good vibes. Creative Yoga London put together special yoga classes and events for singles. At their dating events you will get the chance to meet other like minded yoga goers and the chance to get close by holding hands, looking in the eyes and maybe even laughing along the way as you do a yoga class together. Afterwards you can socialise with a drink. Yoga mats are provided and the class is £15 in advance or £25 for a double ticket, so bring a friend! 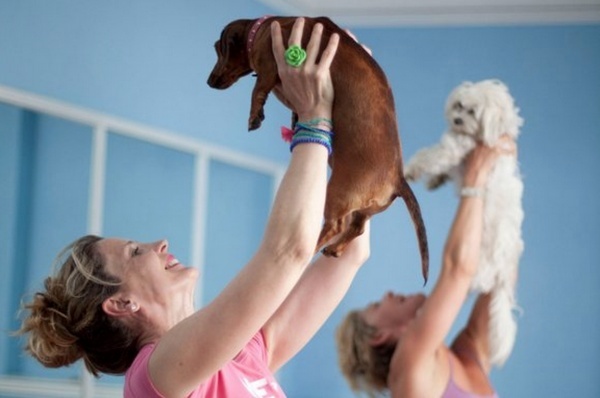 Doga is exactly as the title suggests, yoga with your fluffy friend. Mahny Djahanguiri is a Swiss-born yoga teacher and runs classes in London for people and their pets. Doga was recently featured on hit TV show Made In Chelsea and Doga has since become the hot spot for dog owners to enjoy a yoga class. Given you will probably be doing all the work, the dogs are free to roam and who knows maybe even join in if they fancy it. The first rule of Secret Yoga Club? Do talk about Secret Yoga Club. The Secret Yoga club hosts pop-up events in different venues all across London. Which can be anything from the recent event at the National Trust’s Tudor Sutton House to a historic church. There is live music and food a plenty with sit-down dinners. Voga classes come complete with a live DJ and are a mix of 80’s vogueing and basic yoga poses, dancing moves and if you are feeling like it, vibrant 80’s style outfits. Voga is the brainchild of Juliet Murrell, who after a successful career in the fashion, film and design industry as a set designer, qualified as a yoga instructor in 2011. Juliet developed Voga as a niche for a more expressive style of yoga. It combines the expressive moves of the ‘dance’ class with the breath-synchronised movement of yoga. Bikram Yoga is a series of 26 yoga postures and breathing exercises, although these are all performed in a room with an approximate temperature of 40 degrees. The classes are designed for all levels and last for 90 minutes. Bikram yoga is said to rejuvenate and leave your body feeling energised. A drop in class at the Bikram Yoga studio in Canary Wharf is priced at £20.